Scientists have discovered that plant roots can sense UV-B light and have identified a specific gene that is a vital player in UV-B signaling, the communication between cells. A study published Dec. 8 in the Early Edition of PNAS reveals that the gene RUS1 measures UV-B light levels and passes this information on to other parts of the plant responsible for growth and development. A low dosage of UV-B light, for example the levels found in shady conditions or under fluorescent lighting, can provide important signals to the rest of the plant and is therefore beneficial to normal plant growth. It helps young plants stay on the right track of development and aids seedling morphogenesis, but too much UV-B light can be toxic. The study found that plants with a mutated UV-B light sensor gene become hypersensitive to UV-B light and even under low intensity levels of UV-B light, their root growth is stunted and they fail to grow leaves. 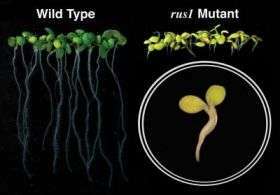 Therefore the RUS1 gene is responsible for ensuring that young seedlings develop normally even when their roots are exposed to UV-B light. It's unusual that roots, normally covered in soil, should have sensors for UV-B light, but the RUS1 gene is crucial at the young seedling stage when a plant's roots are resting on the soil surface. Later in a plant's life, roots can be exposed after rainwash, geological movements or animal activity. The discovery of RUS1 provides scientists with a platform to examine other key genes that receive UV-B light and translate light information into how the plant should develop. Why don't plants get sunburn?